Oh dear, have we made a terrible and expensive mistake? For the first time in about twenty eight years I don’t own a car. As far as I can recall I haven’t been in this status since a couple of days after I passed my driving test and bought by my first motor, a clapped out Hillman Avenger. That was the car that I actually learned to drive in, not the one the driving instructor picked me up in twice a week. I spent about six months throwing it all over the road, sliding around corners and trying my best to roll it until I eventually got overconfident and had to be towed out of a farmer’s field by a tractor. That was embarrassing. Since then I have been a mostly sensible/boring driver and have only really been interested in cars as a convenient means of getting from A to B. I’ve always been happy to use buses and trains or ride a bike when it was practical and never really considered myself to be a keen motorist. So I was a bit surprised by how it felt to be sans car. Sorry to disappoint anybody but I haven’t suddenly become evangelically green by giving up driving by the way, it’s just that we are getting a new car which won’t be available for two to three weeks and today I sold the old one. I optimistically put it up for sale as soon as we decided on the change and in just the same way that buses turn up in threes when you aren’t actually waiting for one, it sold almost immediately. So we have no car. More than three quarters of households in the UK own a car and for a brief spell we won’t be one of them. We could hire one of course but where would be the fun in that? No, for now, at least, we will experiment with being a bit weird. I am writing this just a few hours after letting the old car go and I am already overwhelmed by the evidence of how ingrained the automobile has become for the majority of people, us included. (I know there are exceptions out there, some of who may well be reading this. I apologise, you are exonerated.) As soon as we explain our situation to people their reaction gives the game away. You see we have been inundated with offers of lifts from friends, neighbours and work colleagues. It’s very nice of people to be so kind but what shocks me is the way in which people automatically assume that if you don’t have a car of your own then obviously you will need to fall back on the cars of other people. So far, on revealing that we won’t have a car for a few weeks not one person has responded with; “well that isn’t really a problem is it? After all you have legs and bikes and you live on a really good regular bus route”. That just isn’t what we hear. No it is just assumed that you simply MUST have the use of a car one way or another. I’m looking forward to finding out first hand if they are correct or not. Yesterday was our first full day of being carless and ironically we needed to go to the car dealership to sign the paperwork for the new car. We also had some shopping to do so we turned the house upside down locating our touring panniers, lights, inner tubes and bike locks and spent about half an hour re-familiarising ourselves with what a lot of fuss it can be to prepare for riding bikes in the winter; which is where the car comes in I suppose. It’s just so easy by comparison to jump in the car and travel in complete ignorance of temperature, precipitation, gradient or security. It doesn’t even require any special clothing and the lights and locks are all conveniently built in rather than being lost at the back of a drawer in the shed. It’s warm, comfortable and relatively safe and you don’t need padded shorts to drive it. But! And it’s a big but; when we got back from our bicycle based utility trip we felt great. In fact we were buzzing. We achieved exactly what we would have done in the car but we also got a bit of exercise and a natural endorphin based high thrown in for free. We also saved money in the obvious way of not using any diesel but also less obviously by opting not to put a fourth bottle of wine in the trolley by looking on it as dead weight rather than unbeatable value. We often go for two or three mile walks around our village just for the sake of a bit of exercise. This morning however, with the rain falling steadily and the weather station telling us it was five degrees outside, the prospect of another round of tea and toast was much more appealing. Under normal circumstances we probably would have forgone the walk altogether and driven down to the village to the butchers. But these are no longer normal circumstances and so we donned waterproofs and walked to the shops in the rain. As it turned out the rain wasn’t that bad, it wasn’t really cold once you got moving and guess what? When we got back we felt great. Anybody else see a pattern emerging here? Maybe the novelty will wear off. Maybe it won’t. It’s early days but it’s going to be an interesting experiment and won’t it be ironic if, after three weeks, we decide that actually, we can manage without our new car after all. Oh dear, have we made a terrible and expensive mistake? Dear UK government, I would like to apologise but I appear to have used up about two weeks of my allotted alcohol allowance in one evening. I’m very sorry. Our good friend J came round for dinner last night and whilst we were eating Gill’s rich but still healthy chicken and squash cacciatore; decreasing stress hormones and increasing immune cells and infection-fighting antibodies by laughing hysterically and generally having a very wonderful evening, we drank an awful lot of wine. Oh well, rules wouldn’t be rules if they didn’t get broken now and again would they? Anyway, notwithstanding any long term damage, I appear to have got off quite lightly and a bacon butty and a good walk in the snow have restored something close to a feeling of general wellbeing. While we were out on our walk a car slowed down alongside us and the driver made arm waving motions which I took to mean “do you want a lift?” I made arm waving motions back that could easily be interpreted as, “No thanks we are just having a stroll on this lovely snowy winter’s morning to blow away the cobwebs which have formed due to an over indulgence of red wine last night.” He didn’t seem to understand so he stopped, wound down his window and said, “Do you want a lift somewhere?” How nice is that? I’m sure he was genuine because he didn’t offer us sweets or anything. Anyway I declined, explaining that we were just having a walk without bothering to go into the details about the cobwebs and the wine. As he drove off we were infused by a warm glow induced by that ‘kindness of strangers’ thing that reminds you that the world is actually quite a nice place. If cannot becomes can’t and does not becomes doesn’t, if is not is isn’t and did not is didn’t, if could not becomes couldn’t and would not wouldn’t, had not hadn’t and has not hasn’t then why oh why is will not not willn’t? And here’s picture of a very chilly Ribble Estuary from this morning’s walk. I know I have talked about this topic before but I make no apologies for going back to it. Since I last blogged about the odd people we meet we have enjoyed the most amazing hospitality and kindness just to prove that one or two grumpy individuals do not in any way represent humanity as a whole. Way back in May I told you about the lovely sisters we met in Moydart and how one of them who lives in Suffolk invited us to stay with her. Well two months on and a couple of thousand miles further into our journey and Juliet was true to her word and proved to be a wonderful host. She and her husband Brian live in a sweet village on the Suffolk coast and their house joined the likes of Ardnamurchan and Dunnet Head in being one of the few dead end destinations that we have cycled to on the coast of Britain. But it was worth the effort. We enjoyed a fabulous time walking on the beach, eating a wonderful four course dinner with our hosts and their friends Miggy and Jim and generally unwinding from our normal routine. From there we only had a short ride to Ipswich to stay with a cousin of Gill’s who she hadn’t seen for over thirty years. It was a very emotional reunion indeed and it was just as well that Anita’s husband Justin was around to entertain me while Gill and her cousin did some much overdue catching up. For the second night running we experienced the novelty of eating in company around a table and talking till late into the warm summer’s evening. The following morning we were treated to breakfast at a nearby cafe and left Ipswich full to the brim with food and kindness. By now the current heatwave had really started to kick in and the headlines in the tabloid press assured us gleefully that we would all probably expire as the temperatures hit 32 centigrade. They say that warm air is easier to ride in as it is thinner but I was too busy reaching for my water bottle every few minutes to notice. A short ferry ride across the Stour to Harwich provided slight relief but even on the open water it was still unusually warm. 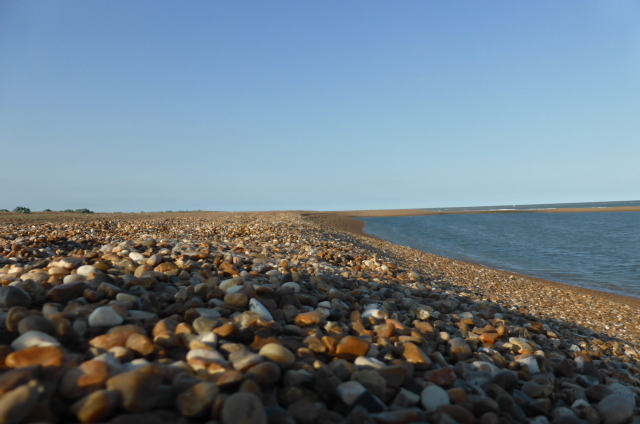 From Harwich we wound through our first Essex lanes via Walton on the Naze to Clacton where we became acutely aware of the change in accent from the softer Suffolk drawl to the one I remembered from my days living in Brentwood a long time ago. We phoned ahead to book a campsite on Mersea Island and check the tide times because the causeway often floods at high tide. Unfortunately our timing could not have been worse and there was no possibility of getting there in time. We navigated in and out of Colchester then as we approached the road to the island the queing traffic made it clear that we would just have to wait for nature to take it’s course and for the waters to recede. 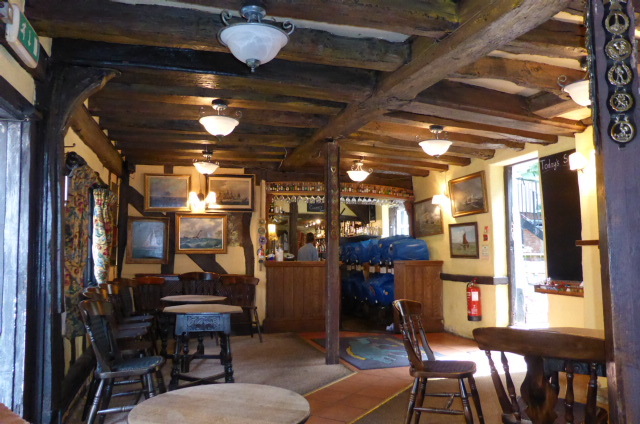 By the time we reached our campsite all the shops were closed but the warden gave us milk for tea and the pub across the road did excellent food and beer. It was a tough day having covered sixty miles in such hot conditions and I have to say those first couple of beers barely touched the sides. 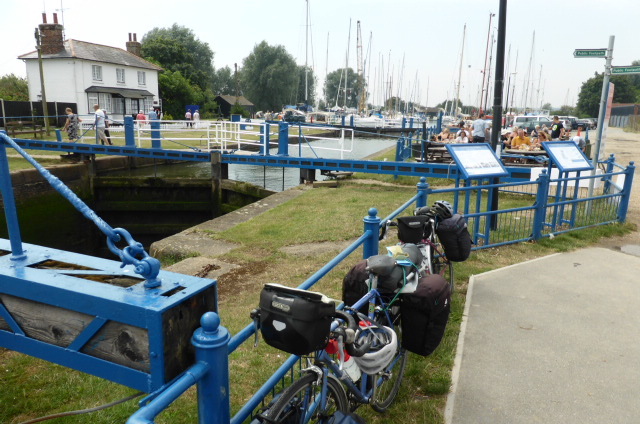 Our next destination was Maldon and yet another example of extreme kindness. Our host Jen was a contact from an internet forum and despite never having met us she opened her home to us, fed us and even offered to let us stay a second night so that we could have a rest day. It was a very generous offer made even more exceptional because she herself wouldn’t be here because of a prior arrangement. Some people really are wonderfully kind and they more than make up for the odd misery guts patrolling footpaths and moaning at cyclists. and we are now relaxing before what is likely to be another night of thunder storms. I can’t stress enough what a difference the kindness of these people makes to us and memories of their generosity and trust will stay with us always. Please don’t believe a word of what the press tell you about the world being full of hatred and violence, it’s not. Oh and you’re not going to die from a bit of sunshine either. If you want to restore your faith in human kindness join an internet forum and ask for help. I am always amazed at the kindness of complete strangers offering help to fellow members of interest groups. It doesn’t seem to matter whether it is cyclists, campers or just consumers. If you ask for help you will generally receive it. Since making our plans we have been offered accommodation, the loan of equipment and storage facilities by people we have never met and who know nothing of our axe murdering past. Only joking, it was a hammer, not an axe and they shouldn’t have been standing there anyway. But seriously, I am overwhelmed by how much people want to help. It seems to be a fundamental aspect of humanity though, this helpfulness. Talk to anybody who has travelled in a self-sufficient manner and they will regale you with astonishing tales of generosity and trust. Of course it isn’t unique to travellers but travel lends itself to situations where one party has a need and the other a solution. What is more, I actually think that these exchanges are a core part of what makes travelling special. There has been a lot of discussion around the benefits of giving to others and its effect on the donor. If you Google (other search engines are available) “giving makes you happy” you will find lots of serious work around the theory. The general conclusion is that giving to others makes you happy. 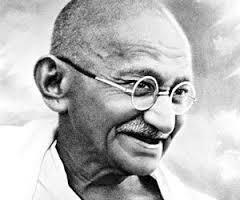 As Mahatma Gandhi said, “The best way to find yourself is to lose yourself in the service of others”. So if giving makes the giver happy, and at the same time solves a problem for the recipient, it is like a nuclear reaction of wellbeing. Both parties feel better and then feed off the positive energy of the other. I don’t know if the type of giving matters. Whether giving money to charity is the same as giving a bed to a stranger. Does giving your time to others provide more, or less, happiness reward than sending ten quid to Sports Relief? Even more interesting is the question of reward. I mean in order to get this positive feedback from giving, does your generosity have to be acknowledged or not? My own view is that it does, even if that only means that you tell yourself that you have done the right thing in making your donation. It doesn’t have to come from a third party but that feedback loop is important I think. I’ve never really understood the concept of altruism. Having started to write this blog with some considerable doubt as to its value, I may now be closer to understanding what it is that I get from it. Yes it’s nice to have a record of our preparations and the trip itself. Yes it’s nice to explore our thoughts about why we are going on this tour of Britain. But for me, I am beginning to realise why I am enjoying the writing so much. You can call it an ego trip if you like but in defence I say it’s a form of giving in exchange for a reward. I give you my ramblings. You read them because you enjoy them, I hope. Some of you send positive feedback and I get the satisfying feeling of having provided a bit of entertainment or food for thought. Win, win. Maybe I’m stretching credulity but it’s an interesting topic don’t you think? Give more, get more: discuss. Warm Showers is an internet based membership organisation aimed squarely at cycle tourists. It enables like-minded people to offer a bed and maybe a meal and a shower to travelling cyclists and to share good conversation, comparing notes on the ups and downs of our passion. Now I would like to think that I might be able to make this blog a little bit interesting to a wider audience than purely other cyclists and that’s why I want to share something about Warm Showers with you. You see, despite the fact that its purpose should only really appeal to cyclists, what it represents is important to everyone. It represents the very best of humanity and something that the popular media would have us believe does not exist anymore. It represents human kindness and generosity, provided for no other reason than because it is a nice thing to do. Of course I accept that there are bad people out there but believe me they are a tiny, tiny minority. Most people are good. Most people will help a fellow human being in need and that is why Warm Showers works. It was first set up in 1993 by Terry Zmrhal and Geoff Cashman and is now maintained by a group of volunteers. The idea is that you register on the site and offer accommodation for free to passing cycle tourists. Conversely, members who are travelling can send a message to prospective hosts requesting one or two nights shelter. I can hear some sceptics muttering, why on earth would you want strangers staying with you but I can assure you it really works for both parties. 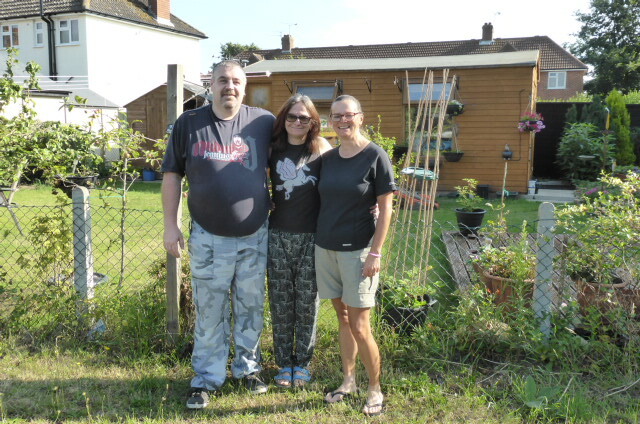 Gill and I hosted our first guests last month and it was a wonderful fun filled experience providing dinner and a bed for the night to John and Di. They arrived very wet and somewhat dishevelled after a hard day’s riding in the rain but they were full of smiles and laughter and from their bulging panniers they produced wine and beer! Despite it being a school night, the dishes went unwashed while the talking and laughter went on. We will certainly keep in touch with them and no doubt cycle with them in the future. It was an overwhelmingly positive experience all round. I think Warm Showers represents something very precious. It is like a beacon, but a beacon that is struggling to be seen from under the black cloak that the media casts over us with their scaremongering stories of bad things lurking around every corner. The reality, when you travel, by bike or by any other means is quite different. There are endless examples in all travel blogs and books of generosity and kindness. Indeed we have experienced it ourselves on numerous occasions. We have been offered accommodation by complete strangers who just want to help, to be useful and for no other reward than the satisfaction that it brings. One of my favourite stories comes from just outside Londonderry in Northern Ireland. We had walked a couple of miles from our campsite in search of a meal but we weren’t having much luck. The bar we ended up in didn’t serve food in the evenings but once we explained out situation the barman didn’t hesitate. “I can run you up the road to Harry’s Bar and Restaurant*; it’s only five miles over the border”. So after we had enjoyed a pint with a few locals he duly took us up the road but he wasn’t satisfied with just giving us a lift. He wanted to know how we would get back to the campsite. We said we would try to get a taxi so he then phoned his nephew who ran a taxi service and told him “an English couple will be phoning you later and you need to pick them up from Harry’s Bar and take them back to their campsite. And make sure you look after them”. The poignancy of this in such a location was striking. But it happens all the time. Travellers like Alastair Humphreys and Josie Dew have endless stories in their books of this kind of selfless kindness from strangers as do all of the travellers we have encountered ourselves. There is strong evidence that helping others is a key ingredient of living a happy life. Don’t take my word for it: Mahatma Gandhi once said that “The best way to find yourself is to lose yourself in the service of others”. So, next time you go to the newsagents and are confronted by yet another doom laden, fear inducing headline about a tide of criminality don’t buy the paper. Go and buy a travel book instead and then go help somebody and be happy. * We found no evidence that the barman was in any way related to Harry and shame on you for even thinking such a thing.